Correa glabra is a tall shrub, endemic to Australia (NSW, Queensland, Victoria, South Australia) with attractive, quite vibrant elliptic leaves, 1 to 4 cm long and 5 to 17 mm wide. Reference books advise that this plant grows to 2 to 3 metres tall by 2 metres wide. I have four Correa glabra plants in my garden in Sydney’s northern suburbs and they have not grown much higher than 1.6 metres in ten years or so. Perhaps if I did not prune them after flowering they may eventually get that height, but I doubt it. They will grow in a variety of soil types as long as the soil is well drained. They are very ‘prune-able’ and shoot from old wood. In my garden, I found they grow better if protected from the hot afternoon sun. A few of my plants are planted in a position that receives only dappled light, in this situation they tend to grow more open and a bit straggly (not recommended). They are very hardy, but look and flower at their best if not grown in a dry position for long periods. The first of many Correa glabra I planted was the green flowering form. Subsequent plantings have been the form with more yellowish flowers. 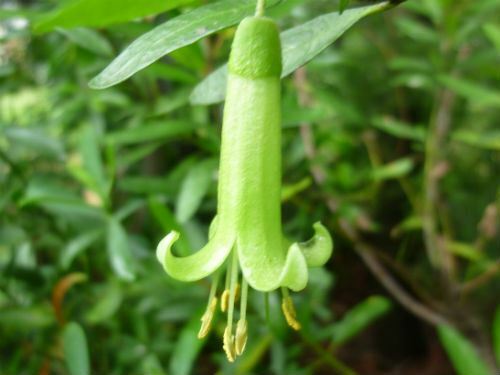 The pendulous flowers are produced during winter and into spring - a long flowering period. Correa glabra can be used as a low screening shrub and makes an attractive substitute the many native lillypillies. A worthwhile inclusion in any garden. Derivation of the name: Correa, named after Correa de Serra, a Portuguese botanist. Correia da Serra was born at Serpa, in Alentejo (is a south-central region of Portugal), in 1750, and was educated at Rome, where he took holy orders. His published writings brought him into conflict with reactionary members of the religious and political hierarchy in Portugal. In 1786, he fled to France, and remained there till the death of Portuguese King-consort Pedro III, when he again returned to his homeland, but political difficulties forced him to leave the country again. He went to England, where he found a protector in Sir Joseph Banks, who was President of the Royal Society. With Banks' support, he was easily elected a fellow of the society. (Thanks to on-line Wikipedia for providing this information).